URGENT: Mission Free Iran’s Ali Azari Balsi to be Illegally Deported by the Swedish Government on 9 MARCH 2012 – TAKE ACTION! به دوستان عزیزمان در سراسر فضای مجازی، بویژه به دوستان بالاترین! در چند هفته گذشته سازمان ما ” ایران آزاد” چند بار به شما عزیزان مراجعه کرده و از شما در ارتباط با پناهجویان سیاسی در شرف دیپورت به جمهوری چاقو کش‌های اسلامی درخواست حمایت کرده است. واکنش شما باعث افتخار و غرور ما بوده است. در این مورد اخیر، با خوش حالی‌ به اطلاع شما عزیزان میرسانیم که جاسبی را نتوانستند دیپورت کنند، و این گام اول و مهمترین قدم در راه وادار کردن دولت سوئد به باز کردن مجدد پرونده جاسبی و تجدید نظر در حکم غیر معقول و غیر قابل قبول دیپورت اجباری بوده است. جاسبی ۲ وکیل مدافع دارد که در ۲ سطح ، سطح دادگاه اروپا و سطح دادگاه‌های سوئد فعالیت میکنند. تمام اهمیت عدم موفقیت دولت سوئد در انتقال اجباری جاسبی به فرودگاه امام خمینی در معیت ۲ پلیس سوئدی و در غل و زنجیر در این است که اولا وکلای جاسبی قادر خواهند بود که پرونده وی را به مراجع حقوقی بالاتر که هنوز به آنها مراجعه نشده است ارجاع کنند، و دوما سازمان مسول پیگیری کمپین سیاسی در حمایت از حق جاسبی، سازمان بی‌مرز بتواند نیروها و امکانات خود را به میدان بکشد.سازمان ما به خواست سازمان سراسری پناهندگان( بی‌مرز) به روال معمول و در ارتباط مستمر با دوستان بی‌مرز از کمپین آنها و در دفاع از حق پناهندگی جاسبی پشتیبانی می‌کند. می‌ خواهیم بگوییم که اهمیت کارتان ، آن چند دقیقه‌ای را که صرف ارسال نامه به آقای وزیر و سکرترش کردید را، دقایقی را که صرف کامنت گذاشتن در پستها کردید، و زمانی‌ را که صرف جلب توجه دوستانتان و اطلاع رسانی کردید را دست کم نگیرید. این یک فعالیت سیاسی بسیار با ارزش است که هم تاثیر روانی‌ دارد و هم سیاسی و هم این که اگر زبانمان لال موفق به جلوگیری از یک دیپورت غیر قانونی نشویم، این نامه‌ها ضامن عواقب حقوقی برای دولت سوئد هستند.. در مورد حسین ما میدانیم که بیش از ۲۰۰ نامه توسط دوستان عزیز بالاترین ارسال شد. اینک میخواهند علی‌ آذری را هم دیپورت کنند. علی‌ آذری عضو فعال سازمان ماست، صرف نظر از پرونده سابقش ، علی‌ در تمام فعالیت‌های ۸-۹ ماه گذشته ما، در دفاع از زندانیان سیاسی و بر علیه اعدام‌ها شرکت فعال و در نقش سازمانده داشته است. علی‌ را نباید دیپورت کنند. هیچ پناهجوی ایرانی را نباید دیپورت کنند. ما در کمال فروتنی یکبار دیگر از شما عزیزان میخواهیم که آستین‌ها را بالا بزنید. ما در مقابل ظلم رژیم اسلامی سر فرود نیاوردیم، وزیر مهاجرت دولت سوئد که جای خود دارد. دستتان درد نکند! امضا کنید و بفرستید. اگر منت بگذارید و نامه را به لیست دریافت کنندگان دیگر(در پست ما یک لیست گسترده ارائه شده است)هم بفرستید نور علی‌ نور خواهد بود. 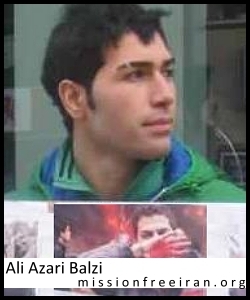 Ali Azari Balsi is a political activist, a blogger, and a political asylum-seeker born in Rasht, Iran, in 1984. Ali himself participated in the 2009 Iranian uprising against the Islamic Republic. He was involved in clashes with security forces, and arrested and detained on one of the largest days of protest during the uprising, 29th of Khordad (19 June 2009). Ali was subjected to torture and beatings for a short time, but was ultimately released on very heavy bail: his family was forced to sign over their home to the regime in exchange for Ali’s release. Immediately after his release, Ali fled the Iran and chose to go to Sweden to seek asylum. He has lived in Sweden now for 3 years, continuing his anti-regime activities: he has participated in and arranged anti-Islamic Republic protest demonstrations on behalf of a known anti-regime organization, Mission Free Iran; and he has been active in blogging. As a result of his activities, Ali reports that his blogs have been filtered, he has received death threats, and his family’s home in Iran, which they were forced to put up for his bail, has been confiscated by the regime. Shokhrollah Azari, father of Ali Azari Balsi. Shokhrollah was a communist worker activist at the Lamp Pars Shahaab factory. As a result of his activism, he was executed by the Islamic Republic of Iran when Ali was just 14 years old. Despite all of this, the Swedish government still intends to deport Ali back to Iran on 9 March 2012, where he is certain to face arrest, detention, torture, and possibly execution, like his father. Even leaving aside the persecution he faced in Iran, Ali’s anti-regime activities in Sweden are more than enough grounds for him to claim his right to political asylum. It is illegal under international law for any government to deport an asylum-seeker to a country where there is legitimate fear of persecution. The Swedish Migration Office has already issued a statement admitting that the Islamic Republic has the interest and ability to monitor Iranian political activists in Sweden, and we have shown in the case of Peyman Najafi that the regime in Iran keeps a very close eye on the status of individual asylum cases that have been denied by the government of Sweden. The Islamic Republic has already made it clear that it will prosecute returned political asylum seekers under Article 7 of its penal code for propagating against the regime. The Swedish government is well-aware of all of this, yet remains intent on illegally sending this young man back to more detention and torture in Iran, in contravention of Swedish, EU, and international law. There is no question that Ali Azari Balsi, a politically active member of a family targeted for political execution by the Islamic Republic in Iran, will be detained, tortured, and possibly executed like his father. Yet the Swedish government has scheduled his deportation to Iran for 9 March 2012. We will not allow Ali to suffer the same fate as his brother & sister. It is up to us to do all in our power to stop this crime by the Swedish government. TAKE ACTION: A sample letter is provided below. Please act quickly as there are only a few days left until Ali’s deportation date of 9 March 2012. لطفا نامه زیر را کپی کرده و پس از امضا و گذاردن تاریخ با کلیک کردن روی نام و آدرس آقای وزیر و سکرتر وی که به رنگ آبی‌ در این جان لینک شده اند آن نامه اعتراضی را در پست اینترنتی ایشان بچسبانید. کلّ این کار ۳۰ ثانیه هم طول نمیکشد اما میتواند علی‌ آذری را از دیپورت نجات دهد. I am writing to you to demand an immediate halt to the deportation of Ali Azari Balsi, an Iranian asylum-seeker who has sought refuge in Sweden from persecution by the Islamic Republic of Iran (case no. 11.420.529). Hossein should be immediately released from detention and granted political asylum as is his right under international law. 1) Ali Azari Balsi has been visibly active in publicly protesting against the regime both inside Iran during the 2009 uprising, as well as in Sweden as activist with an established anti-Islamic Republic organization, Mission Free Iran. Anti-regime activists are usually charged by the Islamic Republic with “propagating against the regime” and “moharebeh,” which carries the death sentence in Iran. 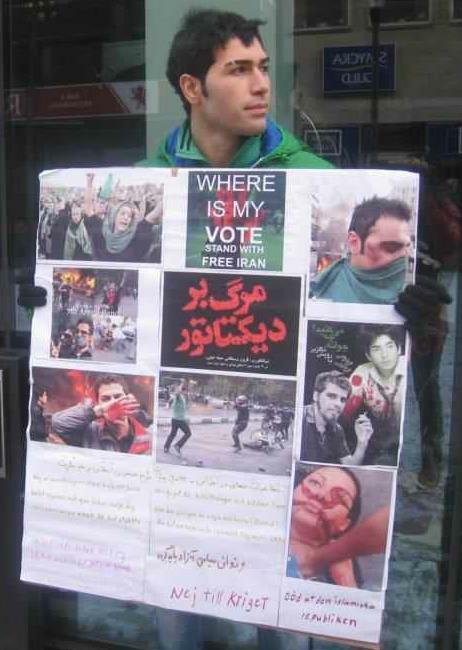 The case of Mohammad Amin Valian – sentenced to death for participating in the 2009 post-election protests (not to mention the thousands killed and raped in regime prisons during that period) underscores the threat to Hossein’s life (see: http://www.iranhumanrights.org/2010/02/valian-student-sentenced-to-death). It is obviously illegal under international law to return such an anti-regime political activist to Iran. 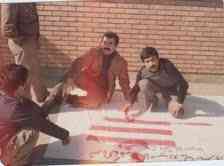 Notably, Ali’s father was executed by the regime for his political views and his activism for workers’ rights. Ali himself has been detained and tortured. It is thus based on a reasonable fear of persecution that Ali fled for his life to Sweden, seeking asylum, which is his right. Yet the Swedish government has decided to detain him in preparation for an illegal refoulement on 9 March 2012. I do not accept this. 2) The Islamic Republic considers all Iranian political asylum-seekers to be criminals, deeming their quest for asylum as propagating against the regime. The Islamic Republic has on several occasions declared and applied its intent to prosecute returned political asylum-seekers, on the basis of Article 7 of the Islamic Republic’s Penal Code. Rahim Rostami, a teenaged Kurdish asylum-seeker returned to Iran by Norway and immediately imprisoned is only one such example. Ali Azari Balsi has sought political asylum and therefore, under the Islamic Republic, is subject to prosecution by the regime. 3) The Migration Office’s own Director for Legal Affairs “concludes that the Iranian regime has both a strong desire and the ability to monitor its citizens in Sweden.” Ali Azari Balsi’s anti-regime protest actions have been widely disseminated via Facebook, blogs, twitter, and other social media. Under the Migration Office’s own admission, the Islamic Republic’s monitoring of activists has required a change in policy with regard to asylum-seekers who are active against the regime while in Sweden. Both the Swedish government’s own policies and Article 94 of international refugee law (“sur place”) require that Ali Azari Balsi be granted asylum in Sweden. 4) It is illegal under international law for any country including Sweden to deport a person who has a legitimate fear of persecution in their home country. It is therefore undeniably illegal under the same international law for the Swedish government to participate in the crime of deporting Ali Azari Balsi to Iran, where he will be detained, tortured, and possibly executed if he is returned to the blood-soaked hands of the Islamic Republic. Despite this finding, the Swedish government continues to illegally attempt to deport Iranian activists like Mohammadreza Hamedian Esfahani, Hossein Jafar Ali Jasbi, Marzieh Kamangar, Mehdi Maleki, Keivan Soufastaei, and others, all of whom are clearly and undeniably at risk not only of detention and torture by the Islamic Republic of Iran, but at unquestionable risk of execution. We demand an urgent, immediate halt to Sweden’s intended illegal refoulement of Ali Azari Balsi, who is at clear risk of persecution if returned to the Islamic Republic. Given the the Migration Office’s blatant, incessantly repeated violations of international law regarding refugee rights, risking the lives of Iranian and other asylum-seekers, we demand that Sweden must not only immediately halt the illegal deportation of Ali Azari Balsi, but must immediately cease all deportations to Iran. « کلّ این کار ۳۰ ثانیه هم طول نمیکشد اما میتواند حسین را از دیپورت نجات دهد. Ali free nu nu nu. Please do not put back Ali Azari Balsi in hands of criminels. Om han hade inte problem, vad skulle han göra här. Hoppas han få att stanna i säkerhet, i Sverige. نابود باد حکومت خون اخوندی…………………………………………………………………………………………………………………………. برگرداندن علی و هر پناهنده ای که از بی پناهی به کشوری پناه اورده جنایتیست که با همکاری جلادان حکومت خون خامنه ای انجام خواهد گرفت چون بازگشت علی به مرگ او پایان خواهد گرفت و در حقیقت شراکت در قتل یک ایرانیست مسئله ای که هیچگاه نه بخشیده خواهد شد ونه فراموش ………………. never diport Ali to Iran.He must be free. Ali’s deportation = give him in hand of criminals. Please Stop it. Do not deport him please.His life is going to be in danger in Iran.Do u accept this responsibility with deporting a human to a danger place? Deportation is against the law Please do not give this young man to hands of Iranian criminal GOV. لطفا حسین را ریپورت نکنید. Please do not deport Ali to Iran thise barberian people will kill him . Please do not deport my landsman Ali to Iran. We all know what will await Ali when he arrives in Iran, prison and maybe hanging order. Please support our people of Iran against the craziness of this dictator and animalistic regime of Iran. please help ali azari and keep him in sweden …… if sweden deport him this mean rhe sweden intentionally kill him .. Please support and stop deporting this young man to Iran. As soon as he get there the govement police will arrest him and he will end up to Evin prison. He will be tortured and will be dead there……… He came out of his own country (Iran)to be safe and stay alive so please stop deporting him. Nobody wants to be a refugee to another country, he did that for his own safety and he is telling that he is NOT SAFE IN HIS OWN COUNTRY…. Do not send this gentleman back to criminals ie the current government in Islamic R IRAN. iran is big jail for all . death for the government. do not deport us to the hell. please don’t deport him. he needs your help. Please donot deport Mr Ali Azad to Iran.Oranien goverment will put ihm in jale.you will Response this Crime. bebakhshid man nemidonam bayad chikar konam,yani nemidonam bayad kojaro emza konam,lotfan mano rahnamaee konid.. I just agree, never deportee to a country that even could be a threath to a human beeing that just expressed an opinion. Stoppa utvisningen av iranska flyktingar. Skicka inte utvisa Ali Azari. Stop udvisning af iranske flygtninge. Vær venlig ikke at deportere Ali Azari. Stop deportation of iranian refugees. Please do not deport Ali Azari. Arrêtez la déportation des réfugiés iraniens. S’il vous plaît ne pas expulser Ali Azari. Stoppen Sie Deportation von iranischen Flüchtlingen. Bitte nicht abzuschieben Ali Azari. Stop the deportation of refugees. To swedish government, Ali needs all the help he can get, but NOT in Iran. What’s their problem. Every Iranian which finally can leave Iran should be recognized as a refugee in every European country. Iran has a dictatorial, brutal and murderous regime. Sweden must stop sending back political asylum seekers to a death row in contravention of the Geneva 1951 convention to which it’s a signatory.